Heart-type fatty acid binding protein (H-FABP): early marker of acute cardiac syndrome and risk stratification in pulmonary embolism. 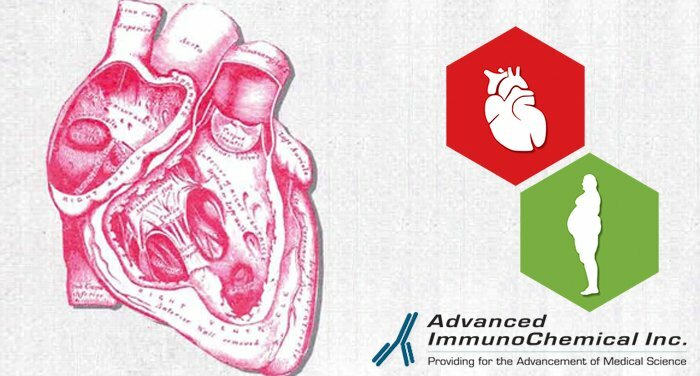 - Advanced ImmunoChemical Inc.Advanced ImmunoChemical Inc.
Home » Article » Heart-type fatty acid binding protein (H-FABP): early marker of acute cardiac syndrome and risk stratification in pulmonary embolism. Heart-type fatty acid binding protein (H-FABP): early marker of acute cardiac syndrome and risk stratification in pulmonary embolism. Heart-type fatty acid binding protein (H-FABP) is a small cytoplasmic protein (15 kDa) released from cardiac myocytes following an ischemic episode. H-FABP is involved in active fatty acid metabolism where it transports fatty acids from the cell membrane to mitochondria for oxidation (1). Click here to view H-FABP AssayNotes and product information. Diagnostic potential: H-FABP is a novel, sensitive diagnostic biomarker for acute cardiac syndrome (ACS). Of all investigational biomarkers, H-FABP has a potential role in very early diagnosis of acute myocardial infarction (AMI), within 1-3 hours of pain (2). When used together with other cardiac biomarkers, cardiac troponins, natriuretic peptides, CK-MB, and myoglobin, H-FABP is useful to identify AMI and ACS in patients presenting with chest pain (3). H-FABP alone is not sufficently specific to be a sole marker for cardiac injuries because it is expressed in tissues other than the heart. Prognostic potential: In addition to its diagnostic potential, H-FABP has prognostic value. Alongside D-dimer, NT-proBNP and peak troponin T, it is the only biomarker that proves to be a statistically significant predictor of death or MI at one year. This prognostic information is independent of troponin T, ECG and clinical exam (4). The risk associated is dependent on its concentration (5). H-FABP has been proven to significantly predict 30-day mortality in acute pulmonary embolism (6). Cat. #8-FABP. Fatty Acid Binding Protein (FABP). Cat. #11-FA-fs. Fatty Acid Binding Protein (FABP) Free Serum. Kleine, AH, Glatz, JF, Van Nieuwenhoven FA, Van der Vusse GJ (1992). Release of H-FABP into plasma aftger AMI in man. Molecular and Cellular Biochemistry. 116 (1-2): 155-162. Sohmuya,K., Tanaka,T., Tsuji, R. Plasma and urinary heart-type cytoplasmic FABP in coronary occlusion and reperfusion-induced myocardial injury model. J. Mol. Cell Cardiol. (1993), 25: 1413-1426. Alhadi, HA, Fox, KAA. H-FABP in early diagnosis of AMI: the potential for influencing patient management. Sultan Qabos Univ Med J (2010); 10: 41-49. McCann, CJ, Glover, BM et al. (2008). Novel biomarkers in early diagnosis of AMI compared with troponin T. European Heart Journal 29 (23): 2843-2850. Viswanathan, K., Kilcullen,N. et. al (2009). H-FABP predicts long-term mortality and re-infarction in consecutive patients with suspected ACS who are troponin-negative. J Am College Cardiology 55 (23): 2590-2598. Kacxzynska, A., Pelsers, MM, et al. (2006). Plasma H-FABP is superior to troponin and myoglobin for rapid risk stratification in acute pulmonary embolism. Clinical Chimica Acta: Int’l J Clin Chem 371 (1-2): 117-123.